Dec. W.C.T.U.The Dec.16, 1969 meeting was held at the home of Eloise Keister with our president Lela Adams presiding. our opening song was "Wonderous Story" The devotion were in charge of Mildred McDowell. She read John 21-25 stating that Christmas is the beginning of life of our Lord Jesus Christ. 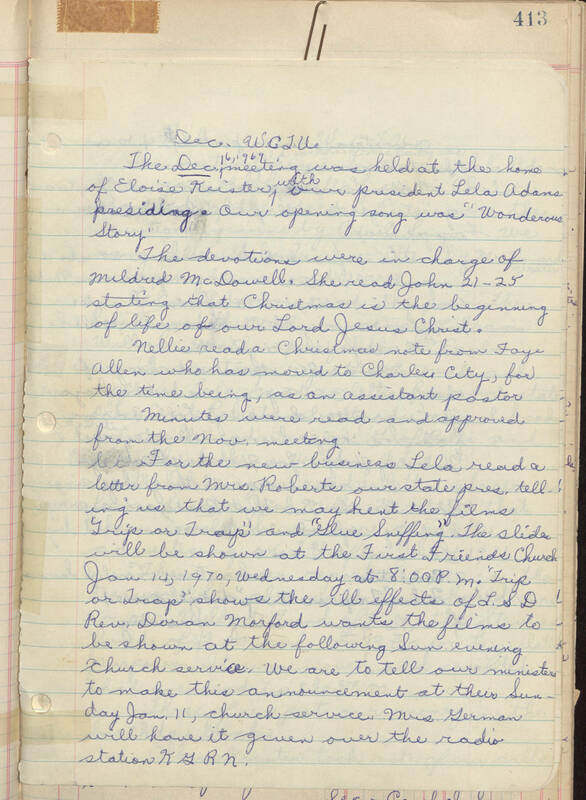 Nellie read a Christmas note from Faye Allen who has moved to Charles City, for the time being, as an assistant pastor Minutes were read and approved from the Nov. meeting let For the new business Lela read a letter from Mrs. Roberts owe state pres. telling us that we may rent the films "Trip or Trap" and "Glue Sniffing". The slide will be shown at the First Friends Church Jan. 14, 1970, Wednesday at 8:00 P.M. "Trip or Trap" shows the ill effects of L.S.D Rev. Doran Morford wants the films to be shown at the following Sun. evening church service. We are to tell our ministers to make this announcement at their Sunday Jan. 11, church service. Mrs. German will have it given over the radio station KGRN.